You need Adobe Flash Player 10 to view this site. Click the Link below to download the player. Matthias Dittrich is an interaction design student, who studing at the University of Applied Sciences Potsdam in Germany. His work areas are usability engineering and human-computer interaction, evaluation, analyzing, structuring and visualizing data. Furthermore Matthias Dittrich has about 7 years experience in planning, designing and implementing of web applications. Shirtless Others is a poem written by Jason Ockert. The born magazine asked me to visualize a poem poem of Jasons. The poem is about a man caught in a dead relationship. While being on a vacation trip with his girl fiend he realizes how fare and disconnected he is from her and how unable to change his situation. The visualization tries to provide a an generic beach situation turning in an nightmare while processing through the story of the poem. To process the story the user has to cut the belly of the shark in the middle of the scene. The approach was to create an interactive and immersive experience which transports the mood and feelings of Jasons poem. The distance comparator is a running app concept for the iphone. It combines data tracking with a buddy list like Skype. In these fast moving times, sticking with friends at one place becomes more and more difficult, this includes people who motivates us to stay in a challenging sports environment. This app tries to solve this issues by tracking the users progress and comparing it with friends data, independent form time or place. The home screen provides and simple overview about the ran kilometers compared to each other. The main purpose is to motivate people through their native need of comparison and challenge. For the 20th annual of the fall of the berlin wall the Berliner Morgenpost launched an application to provide several informations about this event. The application was created by the Berlin design agency Einhorn Solutions. I've had the chance to add some ideas and knowledge to this project. To give the users a realistic experience of this time, we rebuild different place of the Berlin wall, as a 3D Model in papervision. This enables the visitors to have an immersive experience of that time and compare those place with the current state. clr-berlin.com is a corporation website for the Berlin cosmetic manufacturer CLR. It's a slim and simple site, which takes focus on the content. The site is connected to a content management system to keep it up to date. To administrate the product portfolio the system was upgraded with a product management addon. Furthermore we develop a system to manage the contacts of the different offices all over the world, which are presented in a flash world map. The site was designed and realized during my work at the agency "agenturtypen". During creative-training class an existing product was meant to be improved. Our starting product was fit – a dishwashing liquid. The main goal of our idea was to change the look of the packeaging from an simple plastic bottle to a kitchen accessoire. First of all we turned the ordinary plastic bottle into a vase.Through seperate buyable plastic flowsers different fragrance are added to the scentless base liquid. 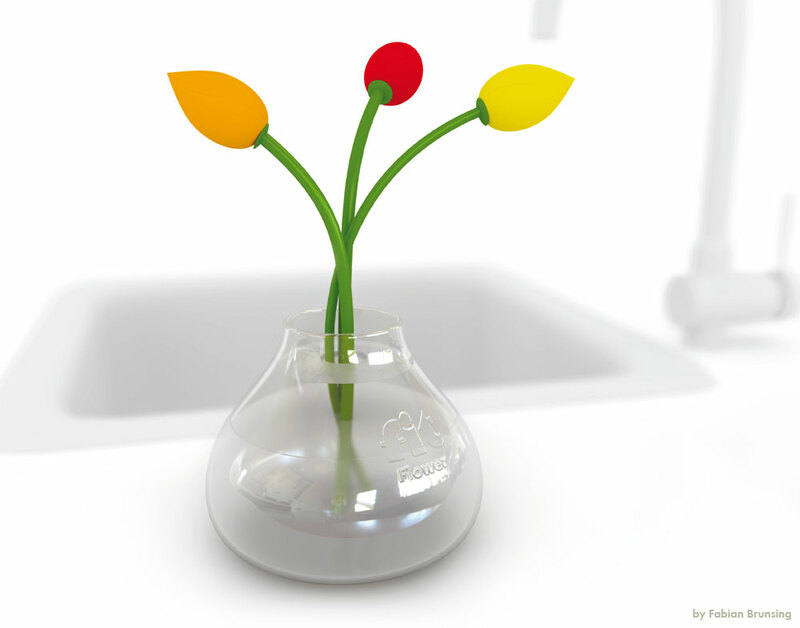 The new fit -flower is customizable through the diffrent flavoures and an eco-friendly system that is easy to refill. For the 5th annual of the designer list (mail distributor of the FHP) we created different visualizations based on the data base. The goal of my approach was to show when and how fast emails were answered, in addition all emails of a weekday were shown in a 24-hours-time strip. The replies are shown by an arc to the origin mail. To show the answer delay about one day, 48 hours are visualized. NERDscape is a geographical visualisation of the internet platform nerdmade (still at work). German universities, which deal with interaction design, are shown by their projects, as a kind of sculpture. The position of the sculpture is directed to the geographical location within Germany. At nerdmade the discipline (physical computing, generative visualisation and screenbased interfaces) and the motivation are positioned in triangles. These qualities were taken over to nerdscape. The discipline is shown about a sphere which is connected to the center line. The motivation appears as a extension of the triangle. Both qualities creates a univerity sculture. Every project can be looked by a detail view of the univerity. In the class "urban interventions" we should design small interventions for the urbane life. Every idea was visualised with a video-prototype. For the style of the prototypes we chose a mixture of real film in combination with illustrations of the important scenes. My illustrations was embedded and animated in the film by Tobias Friese with AfterEffects . The class "cultural architecture" dealt with the architecture of information, these data should be reorganised about new systems. In this work video games were arranged in a matrix. On the vertical direction the games were arranged according to art epochs (metonymic). On the horizontal directions film genres were used. The games which has been influenced by an other games or has been based on an other game were connected by a cord. An corporation portfolio website for apellasbauwert, a real estate investment corporation with headquarter in Berlin. The aim was to design a tidy elegant presence that reflects the enterprise. One important point were the reference-sites with the projects, these should be shown in a very compactly and clear form. To keep the content up to date the site was been realised in WebEdition, a conten managment system. The Site was designed and realised during my work at the agency "agenturtypen". For the annual exhibition of the FHP we realised a population simulation. These simulation could be interventet as a god represented by a lighter, that was tracked by a webcam. The user could put food at the plateau by holding a lighter at one place for a while at the same position or kill the inhabitant by hitting them with the divine aura. The godengine was a small installation. The motivation was just playfil, playing with the tracking abilies of processing. Also involvend in the project were Christopher Warnow, Tobias Friese and Johannes Tonollo. The LightCubes deal with the everyday problem of controling light. The case of switching on and off the light seems to be simple, but in the real sens this action is a very abstract prozess. The LightCubes make light haptic by combining the switch with the luminary, by adding or removing cubes the brightness in- or decreases. Since a cube has six sides we added a color attribute to each side. Depending on the top facing side yellow, red, green, blue or brightness is added to the group. The siced side is the off switch turning on cube off, shuts down the hole group. The projects was a cooperation with Johannes Tonollo. Narratives 2.0 allows people to experience music in a visual way. Therefor the frequencies of a music piece are analyzed frame by frame. The frequencies are laid out fan like, symbolizing the growth of music building up to the main theme. The increase the emphasize of significant patterns of the music a highlight was added. The goal of the visualization was not to create a deconstructabel code. The established system should rather enable the music to become a visual artist by itself, creating an aesthetic response to it's music. Operation couch potato is a small Flash game which was provided for advertising purposes of the online shop "nuss24". The game should provide the fact that nuts are healthy and chips or onionrings unhealthy. The game base on the tele-game-principle, the player moves the figure between three agreed positions and eat or zap the falling objects. The game was realised during my time at the agency "systemtakt – neue medien".